The Arc Jacksonville Pooled Trust is a Special Needs Trust for persons with disabilities. The Arc Jacksonville, Inc. serves as the non-profit trustee of the Trust. 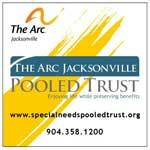 The Arc Jacksonville Special Needs Trust is a “Pooled Trust” fund created to manage funds for supplemental needs during a beneficiary’s entire life. A beneficiary can receive funds from such a trust without compromising public support such as Medicaid, Medicaid Waivers, Supplemental Security Income (SSI) and certain other benefits available through the state of Florida. Thus, individuals with disabilities who receive an inheritance that would jeopardize benefits can deposit the money in a pooled trust and not lose the benefits. What does “Pooled” refer to? Funds from individuals or interested parties are “pooled,” or combined, to meet standard requirements (usually $250,000 or more) for a professionally managed trust account. Even though the funds are “pooled,” each beneficiary will have a separate account consisting of his or her assets. The income from the trust is used only to provide “supplemental needs,” rather than basic needs, such as housing and food. Supplemental needs can include costs of hobbies, vacations, recreational activities, as well as extra training in vocational and independent living skills. Once a trust account is established, family members or other interested parties will make written requests for disbursements from the Trust. Disbursements are made on behalf of the beneficiary directly to a vendor. For example, if the beneficiary wants to buy a bicycle, the check is made out to the bicycle shop. Planning Is Crucial: Why You Need To Be On Top of Wills, Trusts, and Guardianship. Set up a plan for when you're not here. Keep this in mind. Understand the basics, but don't get lost in the details. Keep an eye on the calendar- 18 is still a magic age. Part of a package, but, most importantly, it's best for you to make decisions, not a judge. Living Will/ Advance Directives- take care of yourself, too. Power of attorney- very useful. It's better for you to make decisions about what you want, rather than others making decisions for you if you're not able to express yourself. Terry Schiave Case- whole case was because she didn't have a living will and someone- a judge- had to decide what she would have wanted. Why is this important? Because making these decisions is very, very rarely a decision to simply "pull the plug". It often involves withholding medications and/or food and water. Living Wills (continued) Items to address in a Living Will- mobility assessment; cognitive assessment by several experienced professionals; swallowing assessments/therapy; assistive technology assessment; pursue cutting edge therapies/procedures/technologies. Special Needs Trusts have only one simple purpose- to allow persons with disabilities to keep assets (property, money, etc.) and still qualify for public benefits. By using a special needs trust, a person with disabilities can avoid a "spend down" of their assets. If you leave a person with disabilities more than 2,000 they will lose their benefits until they "spend down" their money. Avoid the need for a "spend down" with a special needs trust. Special needs trusts are not a loophole or a gimmick. They are specifically authorized by Federal and state statues. Why should I worry about this? I don't have any money. A special needs trusts will protect your child's benefits. Consider purchasing a life insurance policy to fund the trust. A simple term life insurance policy can be as low as $10 per month. Creat a fund for when you won't be there- when your child will need it the most. Think about the alternative of not setting up a trust. Your loved one with disabilities will end up, when you're gone, probably receiving enough assets to kick them off of their benefits. The effort you put in on the front end will pay off in the benefit to the person with disabilities in the end. What should be in the special needs trust? Think of a trust as a tool to improve the quality of life of your loved one with disabilities. Why you should have an experienced attorney draft your special needs trust. What type of special needs trust do I need? Advance planning can preserve options so that more flexible trusts, like third party special needs trusts, can be used. Once the money is in the hands of the person with disabilities, the only option is to use a type of "pay back" trust. The choice of a trustee is vital. The trustee makes all the major decisions for the trust, including how and when the money in the trust is invested and spent. You can't buy trustworthiness. The trustee should be trustworthy beyond question. Spending trust money on something that's not allowed by the government can result in the person with disabilities losing their benefits. "Trust Advisors" or "Trust Protectors" help insure that the person with disabilities has the highest quality of life possible. Part Nine- About My Organization, How We Can Help You. The pooled trust is the only special needs trust option for those persons with disabilities over the age of 65. They cannot establish any other type of special needs trust with their own funds.